For making the salsa: combine all ingredients in a large bowl, stirring carefully so as not to crush the fruit; refrigerate until ready to use (can be made the night before). For grilling the swordfish: combine all spices together into a small bowl, and set aside. Gently pat the steaks dry with a paper towel, and sprinkle evenly with spice mixture – rub the spices into the fish, and repeat with the opposite side. Drizzle both sides of the steaks lightly with olive oil. Preheat a gas grill to medium heat – grill swordfish steaks about 5 minutes per side, or until cooked through (will vary based on size and thickness of steak). 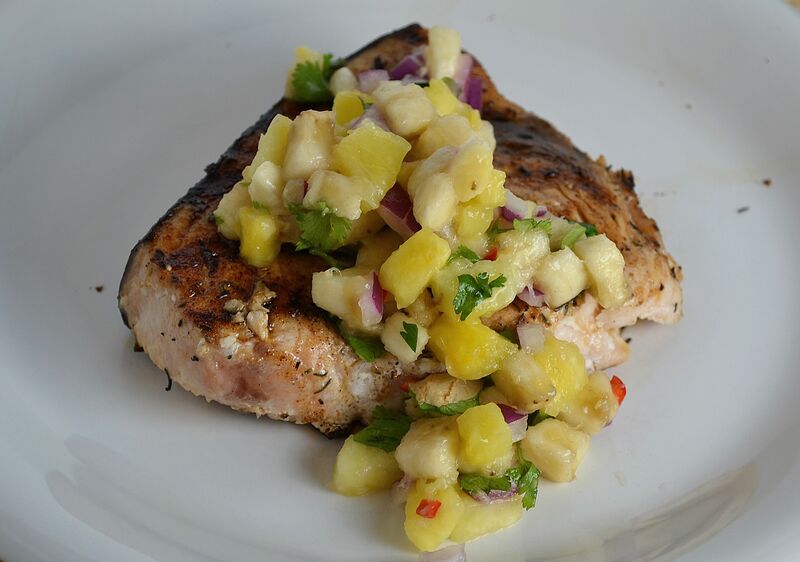 Remove from heat and garnish with banana and pineapple salsa; serve immediately.